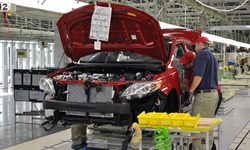 Many organizations have trouble sustaining lean manufacturing. Toyota is one of the few exceptions. According to Jeffrey Liker and Gary Convis in their book “The Toyota Way to Lean Leadership”, their secret is their leadership system. Acting as a sensei themselves, which means improving processes and people at the same time. A Toyota leader does not force people to implement a pre-cooked solution, but helps, coaches, encourages and challenges them. As a result, they do not only improve their work but also their problem-solving and leadership skills. Aligning local improvement efforts horizontally, to ensure that higher goals are accomplished, such as an increased flow end-to-end. Aligning improvement efforts vertically, so that everybody contributes to the mission of the company. What can other companies learn from Toyota’s ingenious mentor-mentee system? Below our findings, and the comments of Jeffrey Liker about that! Two years ago, the situation in the confectionary factory of Leaf was very worrisome. Regularly, delivery to the customers was late, there were quality problems, and there was a lot of waste. According to the managers the employees were to blame: they were said to be “incompetent”. However, an entirely new management team proved the opposite! Negative energy was converted into positive energy, by way of Appreciative Inquiry. This method emphasizes current strengths, and expands those strengths later. The results are astounding: One year after everyone started to work together to achieve a Lean transformation, the factory has already become profitable again. The power and magic to say 'yes' to customers immediately! 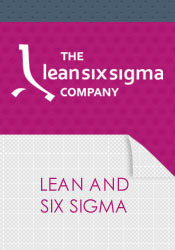 Many organizations use Lean, Six Sigma or TPM to increase the value they create for their customers. Applying tools from these methods, like Value Stream Mapping or Kanban, is however not enough. This is acknowledged by companies like Philips, Sara Lee, ASML and Volvo. How to deal with the people part of continuous improvement? In this article, managers from the multinationals mentioned above explain how they show that everyone counts, and should contribute to improvement. Inspiring employees requires above all feeling for their emotions: how do they experience their work. Interestingly, the same can be said regarding the customers. Today, how customers experience your products or services determines if these will be successful. Philips wants to accelerate ! 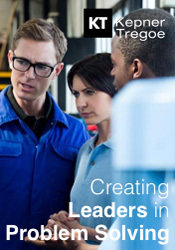 A successful people based Lean approach in factories called Simply Philips, to get everyone involved in continuously improving production processes. A Lean Six Sigma Black Belt program for rapid breakthrough improvement, which was also a management development program for future leaders. In 2011, these two approaches merged into one new Simply Philips program. Besides that, a new initiative called Accelerate! was launched to increase business speed and innovation. Do you want to know what lean working, thinking ánd managing in a hospital looks like, and what the results can be? 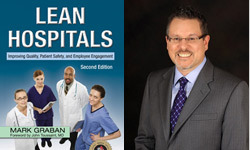 The second edition of the book Lean hospitals of Mark Graban gives you a clear and well-balanced introduction! Almost all aspects pass in review, from standardizing and improving work, to creating flow and engaging employees. Also the need to create a problem-solving culture is addressed, be it on a basic level. What I liked in particular is the practical line of approach. There are many inspiring examples, but Graban explains that you should experiment – of course without jeopardizing the quality of the care - to find out what works in your ward, laboratory etcetera. Typical Lean objectives like zero waste and creating a One Piece Flow should only serve as a direction for improvement, and the application of tools like 5S should not be exaggerated. It should always be kept in mind that the primary goal is more value for the patient. Lean tools are useful if these solve problems and reduce waste, with interfere with patient care. There were only two things I missed in this well-written book: The concept of creating clinical pathways for patients with similar symptoms, and making a business case for Lean. There are people who grasp each problem within Toyota, to state that Lean manufacturing now really is out of date. Others fight tooth and nail to defend the production system of the Japanese car manufacturer. Both attitudes are rather peculiar. What we call Lean today, is no more or less then the state-of-the-art to deliver good quality products or services on time, and at the lowest possible cost. So, even if Toyota fails, this does not mean that Lean comes to an end. Regardless of how well Toyota is doing, our view on smart production will continue to evolve, like it did during the last century. 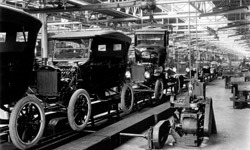 Nowadays, the attention for the organisational side of Lean increases. How can I make problem solvers of all my employees, is a question that many Lean researchers try to answer. Besides that it catches the eye that Lean turns out to be applicable in an increasing number of organization types. 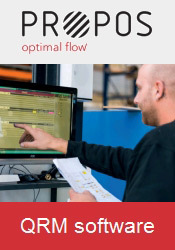 Even design to order production and administrative processes can be made Lean. This is also a matter of evolution, since Lean is adapted to match with these new environments. 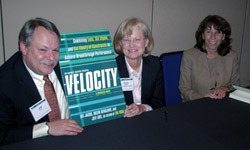 Gerritjan van der Ven, plant manager at Balchem in Italy, reviewed the book Velocity for us! His findings: "The authors recognize that only with a combination of the main logistic manufacturing theories you will get the breakthroughs you need in today’s competitive environment. This is a big plus, since the literature I studied so far kept especially Lean and the TOC strictly separated. Until now, it was like you had to choose between the Beatles and the Rolling Stones! Lean, Six Sigma and the TOC all have their own strong points and weaknesses. As a plant manager I discovered myself how well a strategy based on TOC, can be filled in practically by applying Lean and Six Sigma tools. This approach I found justified in the very readable business novel Velocity. TOC should not only be used to maximally exploit a bottleneck machine, but should also be applied broader, to find business constraints on a strategic level. When the TOC is applied that way, practical tools from the Lean and Six Sigma toolboxes can be used on the operational and tactical level, to relieve those business constraints. In my opinion, this book about achieving breakthrough performance is also a breakthrough in manufacturing theory. However, there is also a minus: The examples of Lean and Six Sigma are weak and don’t show how these methods can really accelerate a TOC implementation. 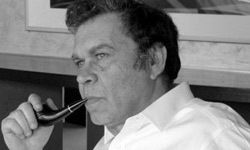 This is a missed opportunity"
In memoriam Dr. Eliyahu M. Goldratt (1947-2011): "Every conflict can be solved"
After an illness of several months, Eliyahu Goldratt, managementguru and founder of the Theory of Constraints (TOC) passed away. At the time he stayed in his house in Israel, surrounded by his family and friends. In the first place our thoughts are with them. Besides that, Goldratt’s death is a big loss to the process improvement community. There are many models to evaluate logistic outsourcing possibilities. However, none of these include in the assessment which part of the material handling should be part of the deal. This is crucial for companies with lean operations. In that case, wrong decisions can be a direct threat to the flow from raw materials to the final product. Scientists from the university of Groningen in the Netherlands therefore developed a conceptual framework to evaluate outsourcing possibilities, based on two things: the location and the type of material handling. This new framework was successfully tested within truck manufacturer Scania in the Netherlands. This company considers logistics outsourcing, to meet an expected increase in demand. Isn’t it obvious? Why even obvious solutions are not always accepted! Due to the immense popularity of Eli Goldratt’s book The Goal, his Theory of Constraints (TOC) is often equated with maximally exploiting a resource of limited capacity (a bottleneck). However, it is much more than that, argues Goldratt at the end of his last book “Isn’t it obvious?”. I agree: The core of the TOC is mapping causes and effects, to find ground breaking business opportunities to focus on. In his article Standing on the shoulders of Giants, Goldratt already positioned Lean manufacturing as a method with the same roots as the Theory of Constraints. In Isn’t it obvious he goes a step further. The way in which he analyses a retail chain, by mapping causes and effects, is still typically TOC. However, the solutions found – demand driven replenishment, mini-markets in warehouses, go see how your suppliers operate and find a win-win solution – all are typically Lean. The cinematic book Isn’t it obvious not only shows what can be accomplished with the TOC in a retail chain, there is also a deeper message in it. Good solutions are often based on correcting wrong assumptions. Therefore they look embarrassingly simple, once you found them (remember Archimedes yelling Eureka?). However, this does not mean that everyone will accept these ‘obvious’ solutions at once! Hidden in the book, there is cause and effect logic to be used for change management. People can have a distorted picture of the gold, the pain, the crocodiles and/or the mermaids associated with change. If so, these wrong assumptions should be corrected. Toyota Kata: A company full of problem-solvers and coaches! After six years of research in Toyota factories, Mike Rother describes in his book Toyota Kata how this car manufacturer manages their people.Toyota Kata is an excellent book, which really adds something new to the existing Lean literature! The main message: Behavior routines, the so-called Improvement Kata and Coaching Kata, determine how everyone within Toyota strives iteratively to reach a Target Condition. This brings the company a step closer to a Vision, be it along a route that is a priori unclear and full of hidden obstacles. This is therefore something completely different then our management by quantitative and financial targets, in which not only what but also how things should be done is determined beforehand. This results in ‘projects’ or ‘action-lists’, which often often fail due to unforeseen barriers. This organizational difference explains why many Western companies until now often could become Lean, but failed to stay that way. Toyota turns out to be an organization in which everyone is a problem-solver, guided by a coach! Can we learn to climb a mountain in the fog like Toyota does, and perhaps even become better than they are in developing new Lean tools? Read what we learned from this book. In addition, author Mike Rother reacts extensively to our findings! 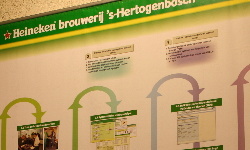 The Total Productive Maintenance Program (TPM) of Heineken started in 2003. Thanks to this program, all breweries produce increasingly more efficient and with fewer losses. 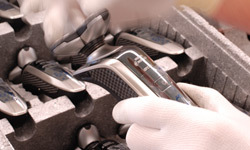 The factory in ‘s Hertogenbosch in the Netherlands is one of the best production sites, concerning TPM. Here, in recent years, the Overall Equipment Effectiveness of the packaging lines rose from 47 to 72%. In addition, productivity and quality are better then ever before! TPM-manager Age Posthuma explains this, by stressing three success factors: deployment, audits, and training. 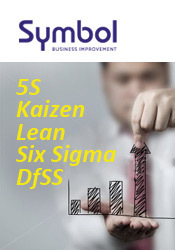 How to apply Lean Six Sigma in a holistic way, to increase your business speed and agility! Six Sigma Guide to Doing More with Less"
Alignment of all your improvement projects with the business strategy. Lean Six Sigma only works well if the right projects are selected. All improvement initiatives should be process oriented and holistic. Reducing costs locally doesn’t make sense when this leads to higher costs elsewhere. The aim should therefore be to increase the value creation of end-to-end processes. At best, this should also encompass your suppliers and distributors (extended enterprise principle). One of the best ways to lower the costs is to increase your enterprise speed, because this will make your company more agile and competitive. 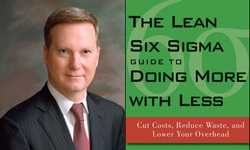 These are the main messages in the book “The Lean Six Sigma Guide to Doing More with Less”, written by Mark O. George. 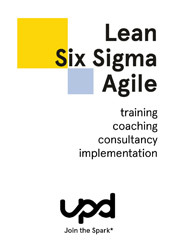 Redefining Lean Six Sigma this way is not completely new, but the book gives a good helicopter view of the best practices today, and you will find many useful insights in it. Minuses are the strong focus on cost reduction and the somewhat confusing use of formulas in some chapters. Mark George responds extensively to our findings! 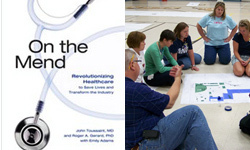 On the Mend: What can healthcare providers learn from the Lean Journey of ThedaCare? During the last eight years, ThedaCare was transformed to a lean and patient-focused health organization, with respect for the work of the nurses and doctors, but with measurable and therefore sustainable results. This journey is decribed in the book On the mend – revolutionizing healthcare to save lives and transform the industry. Not only the processes changed, but also the managers. The introduction of lean principles radically changed their role, which became increasingly humble and facilitating. What can we learn from the lean journey of ThedaCare? 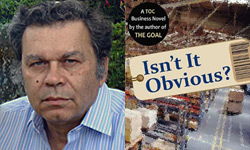 In his article The power of cause and effect no.2: the effects continue, Eliyahu Goldratt, the founder of the Theory Of Constraints, explains what happens when companies don't react to real market changes, but to (exaggerated) fluctuations in the amount of orders placed by what is only the next link in their supply chain. Due to the economic recession, sales of electronic consumer goods dropped by as little as 2 to 3 percent at the end of 2008. However retailers, afraid to be left with inventory, decided to sell the goods on their shelves first, and therefore drastically reduced the amount of new orders in the first four months of 2009.This overreaction was passed on by the electronic consumer goods industry to their electronic components suppliers (link three in the supply chain), who faced an unprecedented drop in orders by 50%, Goldratt explains. A kind of bull-whip effect, but in this case not driven by uncertainty but by fear! Around April 2009, the retailers regained their confidence in the market and started to increase the amount of orders, not only to meet customer demand, but also to replenish their stock. 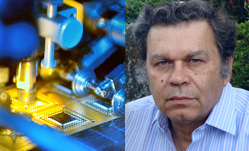 As a result, the next cycle of exaggeration and overreacting now threatens to begin: The electronic components suppliers can't keep up with the current spike in demand, and therefore they think they should invest in extra capacity. According to Goldratt, that is the worst thing they can do. In the end that will not only leave them with overcapacity, also the prizes for their products will drop. Read Goldratt's article below!. Form Quick Response Cells for Focused Target Market Segments. Make this a Unified Strategy, which includes suppliers and customers. It’s about Time is very well written and is much more concise than Suri’s original work published in 1998: Quick Response Manufacturing, A Companywide Approach to Reducing Lead Times. Therefore this new book is very suitable for people who want learn the basics of QRM. 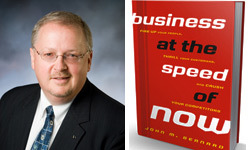 According to Suri, he wrote his new book for busy senior managers. Especially for this target group it is interesting that he added something new, an answer to what historically was one of the weakest points of QRM: How to make a business case! 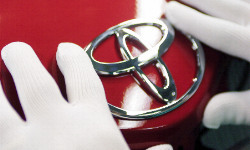 ^ CEO Akio Toyoda: "My name is on every car"
The Toyota Production System (TPS) is the shining example of Lean Manufacturing, though it should be kept in mind that this system is tailored to the needs of Toyota, so that it can't be copied without adaption. Recently, for the first time during its existence, the TPS became the target of serious criticism! The recalls by Toyota of more then eight million cars to replace floor mats and to adjust accelerator pedals, lead to many news reports like ‘Lean Fires Back’. Do the recent recall-problems of Toyota really disqualify the famous Toyota Production System (TPS)? No, on the contrary, they are a sign that a revival of the TPS is requisite! And precisely that seems what Toyota is doing today. They return to their roots: deep self reflection, listen to the customers’ voice to make increasingly better products, and, if any problems are observed: stop, think and make improvements. In this article our extensive analysis, including a response by Toyota Motor Europe. Do you need help with process improvement?